Contests! - 1JUL2014 - Name That Ocean contest! Topic: 1JUL2014 - Name That Ocean contest! Subject: 1JUL2014 - Name That Ocean contest! Anywhere it says "Sea" it can be replaced with "Ocean"/"Zone"/"Landing" and vice versa. Holy moly so many good ones. I'm conflicted about posting more. You want the ideas, but you only want one per player, to make a competition fair. "The term Mediterranean derives from the http://en.wikipedia.org/wiki/Latin" rel="nofollow - Latin word mediterraneus, meaning "in the middle of earth" or "between lands" (medi-; adj. medius, -um -a "middle, between" + terra f., "land, earth"):"
I apologize: I meant to say that many names are welcome, but keep them in a single post. Do not post one in one post, and then another in a new post. Just go back and edit your post and put another. I knew that players would want to submit more than one, so there ya go! I'll edit the original post. My alliance, http://elgea.illyriad.co.uk/#/Alliance/Alliance/125" rel="nofollow - The Slaves to Armok , are mostly made up of players from a game called http://en.wikipedia.org/wiki/Dwarf_Fortress" rel="nofollow - Dwarf Fortress and we, having made our homelands on Farra Isle (we call it Armokkumid) and the Rill Archipelago (we call it Armokfall) since the beginning of the game (or rather since the regions were created), would like to call the ocean Armokmigrur in honor of our patron deity, Armok. Armok has seen fit to bestow his blessings upon the Southern Seas by placing his patron animal, the poisonous crawler, on all available space. By naming the sea after Armok, who is a deity of creation and who symbolizes the creation of a new land, we hope to appease Armok so that he will bestow his blessings upon all the of the Broken Lands. In hope that one day they may be reunited again and the world will turn green and there will be bountiful harvests. if you cover it in fog, add some french fishermen, then place some white cliffs in pamanyallpa. we could all call it the channel. In Peace we reign. In War we RULE! Long live the Royal House of Merlinus! I like that - seconded. So far I think the two best names 2gether would be great, no credit to me tho. from the sound of it, you could fit in in as a name originating from the Yaraquncha or Hanlif, as one of earliest folks crossing the Ocean... with Tow meaning Ocean, and munobenon being a byword for something inbetween, declinated to munobenam. That's actually quite cool ! I think "Bimoda's Private Pool" would be appropriate. Bimoda wins. The great cleavage. Seriously? The Great Cleavage? We got young children playing this game. Could be worse - such as - The Wet Cleft. Ok first off I'm thinking you hope this game grows rather large and expect as it does the World will expand?? In that case being as this is the first should it not be a Sea? And still in that case a few questions who was First to cross it. Who Discovered it? Should it not be somehow tied into Illy history? Just a few questions before I think of a name that might be acceptable. Now yoose guys has upset Guido and Louie. As you know I gave you some important stuff about dis matter and I was expectin' yoose to get it done. Now I sees yoose pullin' dis? I don want to get rough 'cause dat might cause ya some hard sailin' if you knose what I mean. So da name I want ta see plastered between dose land things is "Ajlantic." Capice? Like the "Ajlantic Ocean" for the morons amongst you, and I'm a beginnin' to think dares more den one. An I aint signin nothin as my brother-in-laws a lawyer and he's thinkin' ya might be connected with the GM coppers. Yoose just get the job done right, okay? A cleavage is a divide or rift. Where is your mind at? Some people can make anything dirty. GM ThunderCat> @Marti I though you were going to suggest "Level 470"
Unless you consider the age of 13 to be 'young children'. Which I don't. Everybody under that age is not allowed to play the game, as of recent statements from GM's. Apart from what Bimoda said (dirty mind you have, Arctic :P ), Cleavage is a word used in reading stuff for young adults. Well, I wouldn't consider my mind dirty, since I have never heard "cleavage" used in that way CK. It's like "gay" it normally means happy... unless... yea. But, I never knew "cleavage" had a duel meaning also. 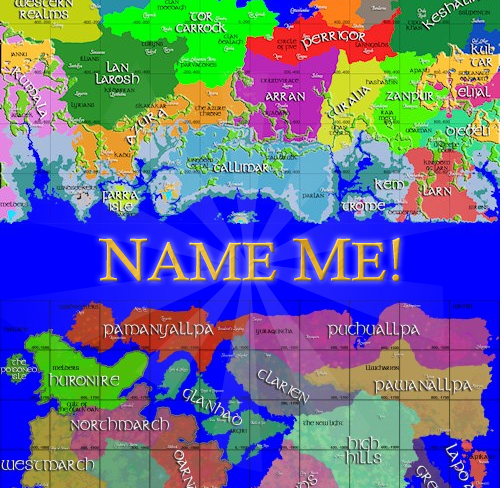 Since the Windseekers were the first ones ones to discover The Broken Lands and bring back news to Elgea, maybe they should be included in the naming of the sea? I imagine them sending a messenger to King Sigurd of Illyria, informing him of the great discovery and since King Sigurd is such a fair and friendly King, he saw it fit to reward these explorers with their efforts. They are also one of the few factions to have hubs on both continents. I believe, that the sea should have 2 names. The people of The Broken Lands will obviously have called the unnamed sea something different than the people of Elgea. Hopefully I'll have some more time before the end of July to think of more lore/history/combinations. I like the idea of the ocean having different names from the perspective of people on different sides of it. Duchy of Parlan, one of the Grand Dukes fell in love and eventually married a mermaid princess. This would explain why, centuries later, the Parlanese have taken on some of the features of the Demersae. It also serves as a good explanation as to why the Parlanese are the only faction that these strange ocean race trade and deal with. I have a few ideas for the name. you beat me to it, Kumo -- I was going to suggest the Straits of Harmless? The dire straits of harmless?